Take Hwy 101 north across the Golden Gate Bridge to Greenbrae. Exit on Sir Francis Drake Blvd. (San Anselmo exit). Stay on Sir Frances Drake Blvd. through San Anselmo and Fairfax, for 22 miles until it ends at Highway 1 in Olema. Turn right onto Hwy. 1. Go 1/4 miles. The campground is on the left. Take Hwy 101 south to the East Washington exit in Petaluma. Turn right onto East Washington, go into left-hand lane. Turn left onto Lakeville Highway. Go one block and turn right onto D Street. D Street becomes Point Reyes Petaluma Road. Continue on for 20 miles (towards the end you will hit one stop sign, continue on straight. The road is Platform Bridge road after the stop sign.) to Sir Francis Drake Blvd. Turn right onto Sir Francis Drake. It ends at Hwy. 1 in Olema. Turn right onto Hwy 1. Go 1/4 miles. The campground is on the left. Take the second exit, Sir Francis Drake Blvd. at the end of the bridge. Follow for 22 miles until it ends at Hwy. 1 in Olema. Turn right onto Hwy 1. Go 1/4 miles. The campground is on the left. Take Hwy 80 to Vallejo and exit onto Hwy 37. Head west on Hwy 37. When you reach Hwy 101, do not get onto Hwy. 101, but take the South Novato Blvd. exit. Follow Novato Blvd. through Novato for approximately 10 miles until it ends at Point Reyes Petaluma Road. Turn left. Continue on for 10 miles (towards the end you will hit one stop sign, continue on straight, the road is Platform Bridge road after the stop sign.) to Sir Francis Drake Blvd. Turn right. It ends at Hwy. 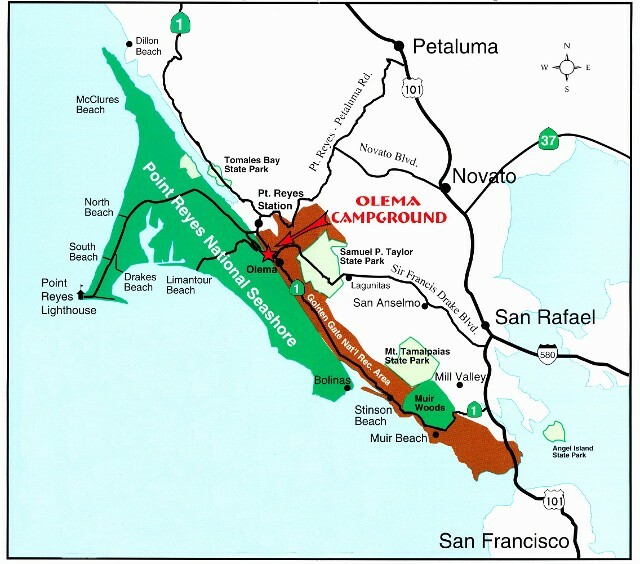 1 in Olema. Turn right onto Hwy 1. Go 1/4 miles. The campground is on the left. If you have a large rig, do not take Lucas Valley Road exit from Hwy 101 or Hwy. 1 north from the Sausalito exit! THERE ARE VERY SHARP TURNS! CAUTION: GPS and internet driving directions may be wrong. They may lead you the long way around or put you on roads not suitable for RV's.